Chandigarh, March 23: The award of the President's Standard and Colours is the highest military honor for an armed forces unit. The selection of the Presidents Standard and Colours is based on the squadron's performance and achievements during both peace and hostilities. President Ram Nath Kovind presented the Standard to the 51 Squadron and Colours to the 230 Signal Unit of the Indian Air Force at Halwara, Punjab on Thursday. 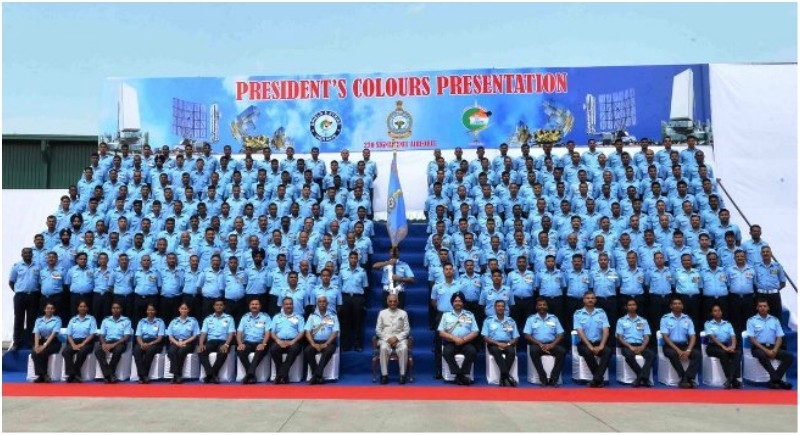 Speaking on the occasion, the President said that the 51 Squadron and the 230 Signal Unit have distinguished themselves in service to our nation. They have a rich history of professional excellence and have served India with honor and distinction, during peace and hostilities. It is a proud moment for him to honor the units for their dedication, professional conduct, and courage. He complimented the personnel and families, past and present, of these units for their selfless sacrifice and service to the nation. The President said that the Indian Air Force symbolizes our military excellence. The performance of its personnel in exercises, both at home and abroad, is a glowing testimony to its high standards. The Indian Air Force, besides safeguarding our sovereign skies, has always been at the forefront of humanitarian assistance and disaster relief operations. The resilience, tenacity, and zeal of our valiant Air Warriors is a source of pride for every Indian.